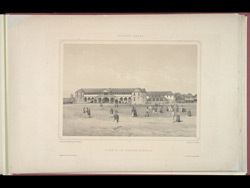 Lithograph from Adolphe Duperley's 'Daguerian Excursions in Jamaica' showing the barracks in Kingston. During the 18th century British troops posted to the West Indies suffered high rates of mortality from diseases such as yellow fever. The House of Assembly, alarmed by the 5% mortality rates, passed a decree to permit the construction of barracks for the troops and the Kingston barracks were built in 1791. The ground floor was kept open to allow air to circulate and the first floor was heavily ventilated by louvered windows.